Our research revealed that a location-specific companion app would make planning and taking a trip to the zoo more enjoyable and interactive. "The majority of visits to our website are from mobile devices so we know that there’s a big audience for our app. It’s a great opportunity for us to enhance the visitor experience by engaging with visitors before, during and after their visit. The app will really get people thinking about what’s around them and will help them immerse in the zoo experience like never before." We first needed to understand Chester Zoo’s customers in order to establish the barriers, problems and opportunities that mobile technology could help address. We did this by observing them, talking to them and testing with them, and subsequently mapped out the full customer journey to ensure the new app would meet their needs. Storytelling using iBeacons, geo-location and push notifications. The geo-fencing feature of the app means that content is customised based on the user’s location; if they're outside the zoo's boundaries, it promotes ticket sales, and when they’re inside, it provides prompts and reminders for events. 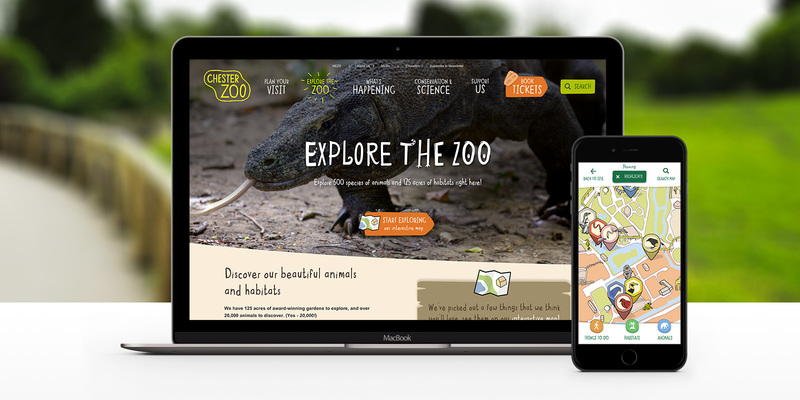 A single Sitecore CMS framework powers the www.chesterzoo.org desktop and mobile websites as well as the app via a bespoke API that was developed by us. This means that zoo staff have total control over content and only have to input it once in order to get it live on the website, the mobile site and the app, which has helped to streamline team processes and maximise the value of content. We’ve increased revenues, improved operations and above all helped the zoo deliver a best in class customer experience. While many attractions have either a mobile app or mobile site, very few – if any – offer an optimised checkout process like Chester Zoo; the functionality we have been able to develop and introduce puts the zoo well ahead of the competition in this and many other respects.